Why Are Hundreds of Affordable NYC Apartments Vacant? Everybody knows how much of a housing crisis we’re in here in New York City. We know that affordable housing is desperately needed and we should try to do whatever we can not only to build and create affordable housing, but to preserve the affordable housing we have. 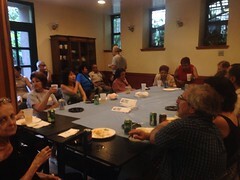 West Side Neighborhood Alliance, since it’s inception, has worked hard to promote the issue of affordable housing and with the help of the community, other tenant and community groups, and elected officials much has been done, but there’s much more to get accomplished. This recent article on Gothamist shows that more innovation needs to be brought to the departments of our city government to see that there are more options available to create and preserve affordable housing, but it’s going to take changing some stubborn bureaucratic minds to get additional options rolling. The story also goes to show that little used programs that have been collecting dust could be unexpected treasures that would be a shame to waste. Furthermore, there are proposals that should be examined by the city, as the more options we have, the better the road to a more livable city for those that need affordable housing will be.